Deep Space Nine hosts a delegation of ambassadors to the Gamma Quadrant, including Lwaxana Troi, while an invasive computer program disrupts the station's systems. The writers are trying to find a use for Bashir, but I'm not sure they're having much success at this point. Does the Federation really want our first contact with new species in the Gamma Quadrant to be initiated by Lwaxana Troi, or is some admiral who has dealt with her too often just hoping she won't come back? I like Odo's speech about "sacrificing plants" and similar absurd things people do when courting. It is always funny to have human behavior examined like that by somebody as alien as Odo. Dax talks about mechanical life forms evolving on their own as though it hasn't been seen before, but the existence of such life is an integral plot point in Star Trek: The Motion Picture. Odo talks about how his mouth isn't a real mouth and how he doesn't have any digestive system or internal organs because he's a shapeshifter. In that case, how was he knocked unconscious in "Vortex"? When they start shutting down the computer, it's very reminiscent of the scene in 2001: A Space Odyssey in which Dave shuts down HAL. Without her wig, Lwaxana looks a lot more like her daughter. The "pup" metaphor is taken way too far. It's not nearly as interesting as the "sour the milk" metaphor from TNG's "Galaxy's Child." 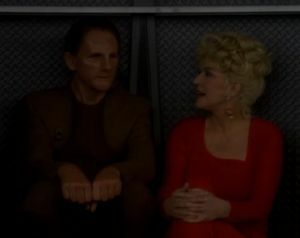 Of the three stories, only the stuff between Lwaxana and Odo is any good. Unlike other guest stars from TNG who have made an appearance on the show (such as Q and Vash in "Q-Less"), Lwaxana's appearance seems logical and doesn't refer back to her TNG adventures more than once. In many ways, she fits DS9 just as well as she did TNG. Here, she is used to draw out Odo, the show's deepest but most guarded character thus far, and she succeeds in extracting some good backstory. Additionally, as with her appearance in "Half a Life," Lwaxana shows a surprising amount of warmth and compassion behind her cloyingly comic exterior. Going into it, I was sure Lwaxana would be the most annoying part of this episode, but in the end, she's the only good thing about it. Bashir's quick thinking saves the lives of the three ambassadors, but Bashir plays it off as luck. If I didn't know better, I would swear this was another hint about his character's big secret.